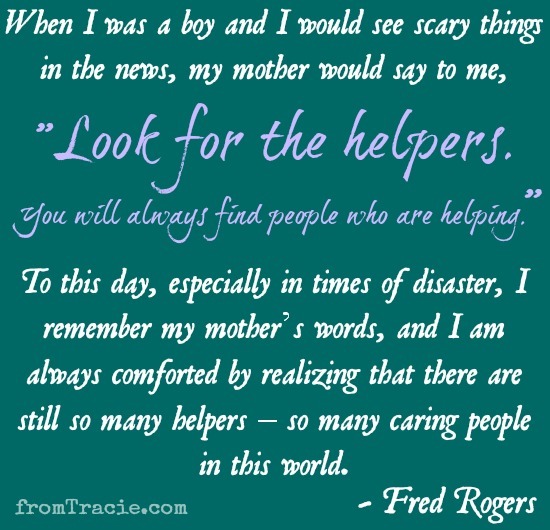 I am still without words after the tragedy that happened yesterday in Connecticut. I think, in a lot of ways, that is okay. What happened was not about me. It is not my story to tell. As much as it breaks my heart, I am still removed from it; I could not even begin to imagine what those families are going through. In the days to come, we will learn the name of each victim whose life was cut tragically short. We will learn stories of heroism and help that happened in that school. We will search for answers that probably don't exist, and try to find understanding that will probably never come. I'm sure we will also hear countless speeches and debates about every aspect of this tragedy - but this is not the day for those things. The speeches and debates and questions can wait. For those of us who don't live in Newtown, Connecticut, this is not our story, and we should honor the people who are living through this tragedy by not using it as a political talking point. This is a day to concentrate on the families who lost loved ones and the children who lost their innocence. This is a day to offer support to a community that is grieving. This is a day to pray, and offer help where we can. A great reminder! Stopping by from SITS today. That's a wonderful quote. It is so sad to think about what happened, I just can't quite wrap my head around it. But you are right, what we can do is pray, keep them in our thoughts, and offer help where possible. I loved this--I couldn't have said it better myself! Well said, Tracie. My girls know all about it. I didn't want to shield them from it. Led to some interesting discussions, for sure. It's OK to feel heart-heavy and angry about it, or just plain sad for the victims. Makes you remember that every hug and every kiss from your kids is precious. Great post! What a tragedy- my heart breaks for these families, the children and our nation. Makes me want to hug and kiss my little guy every change I get! I read that quote earlier too and it made me feel more hopeful.